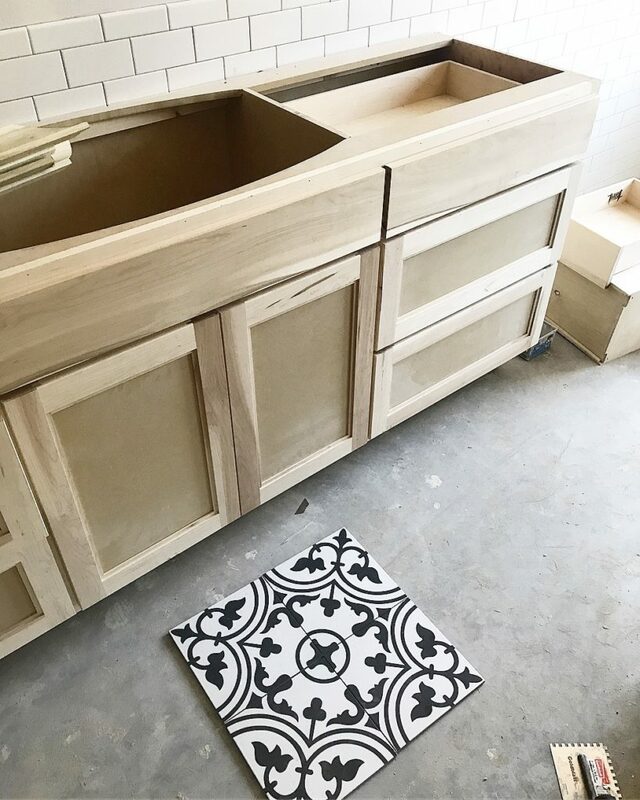 The New Traditional: The Evanston master bath process and progress! 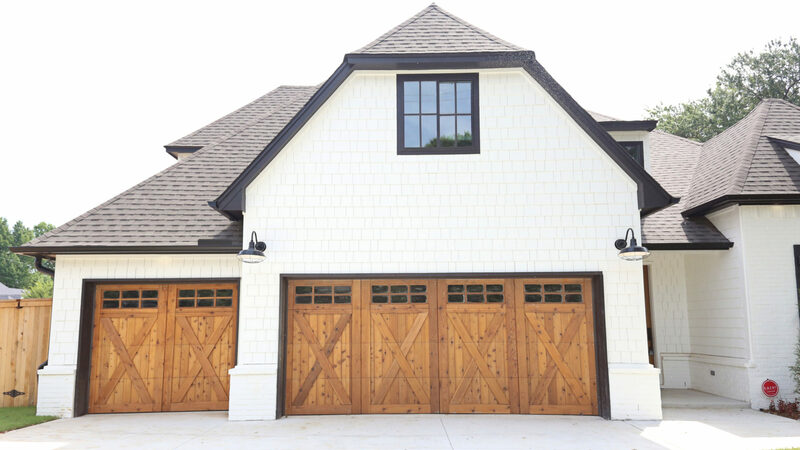 If you read this post, you know that my design concept for the Evanston Project pretty much stemmed from our BYS–the big, yellow stove in the kitchen. I wanted to keep the rest of the palette clean, with a specific nod to the traditional feel of the home. 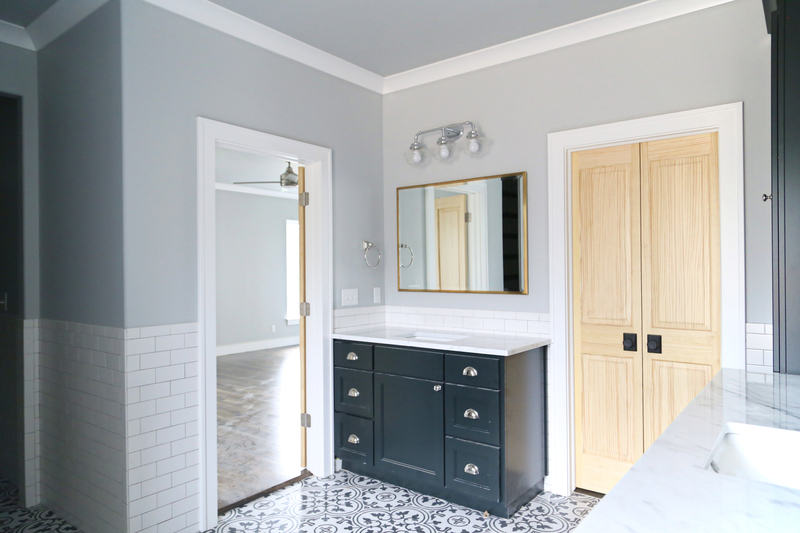 To me, a good, clean, subway tile in a wainscot is a beautiful take on traditional. 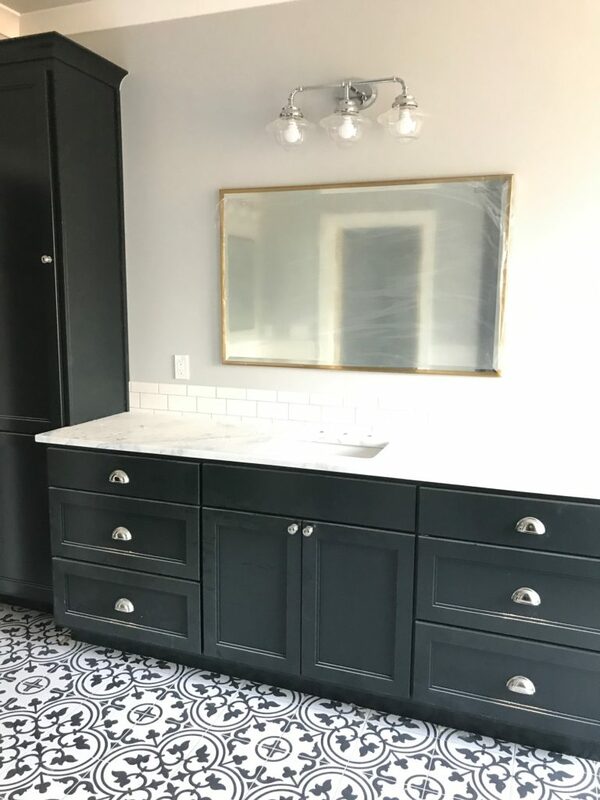 I LOVE subway tile–it is affordable, therefore you can use it in large application, like we did in this sizable master bath. 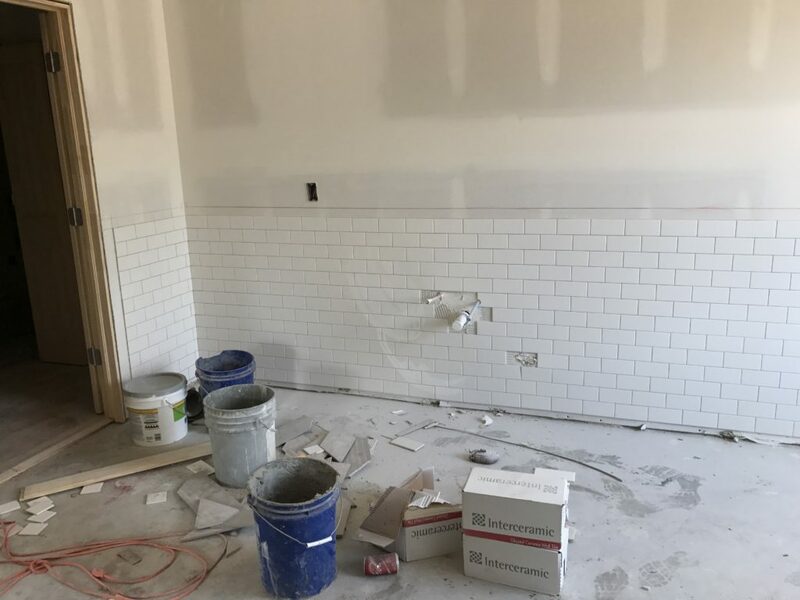 Here is the middle point of the wainscot tile. You can see the space the guys left at the bottom–that is for the floor tile! 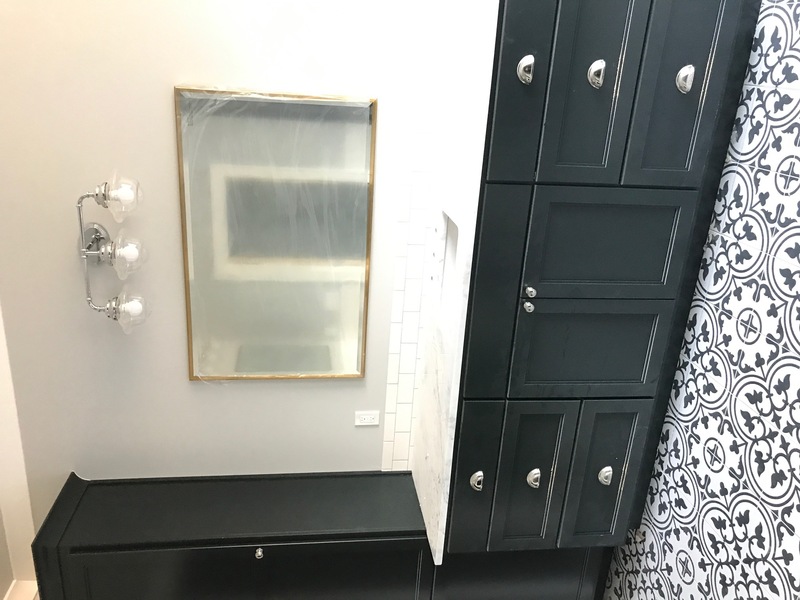 Lots of people ask me about the “trend” of painted or patterned tile. 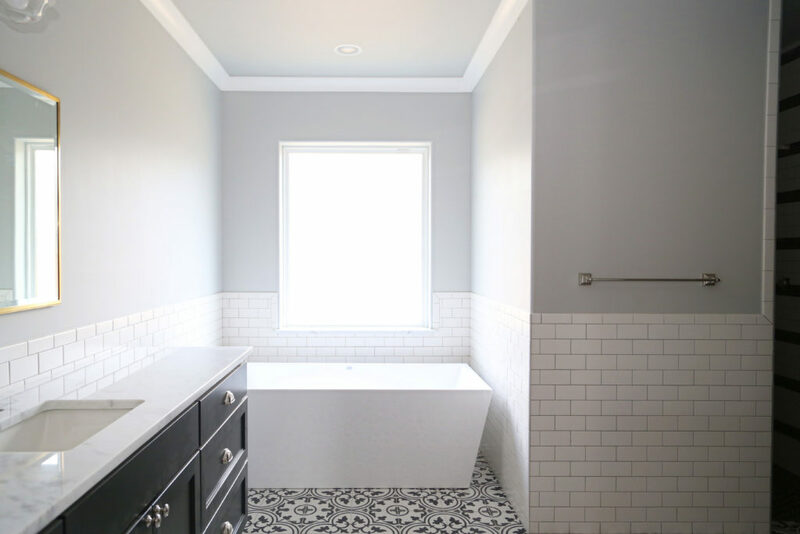 Patterned tile has been around for CENTURIES–I don’t think it is going anywhere. Plus, if you LOVE LOVE LOVE it, who cares? I am a person who would rather LOVE LOVE LOVE something for ten years, than LIKE something for twenty. Personal preference though! 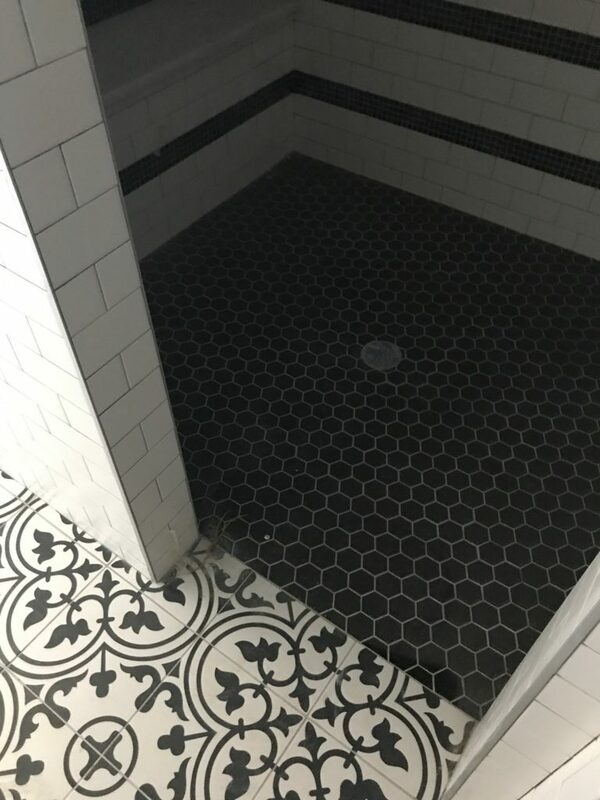 Again, patterned tile aint going anywhere. 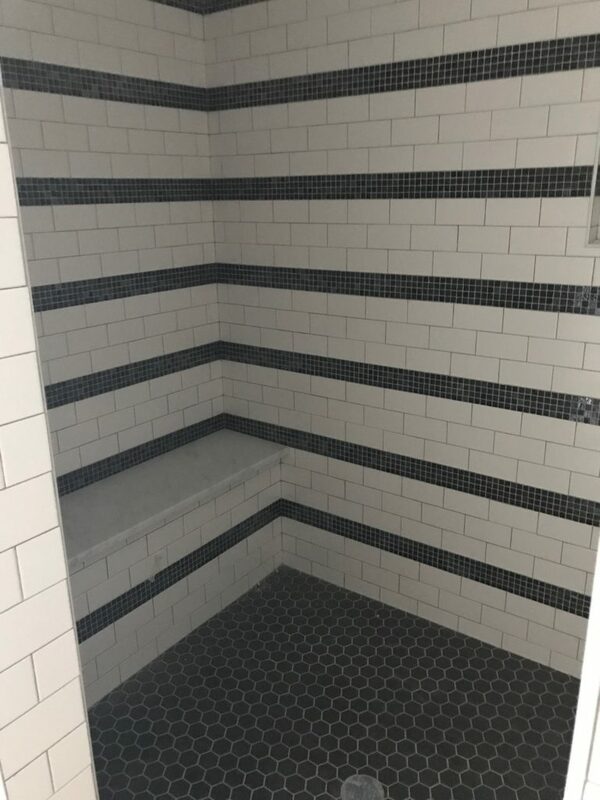 We chose a traditional pattern in high contrast black and white and we couldn’t WAIT to see it installed! Even unfinished, that is just GORGEOUS. 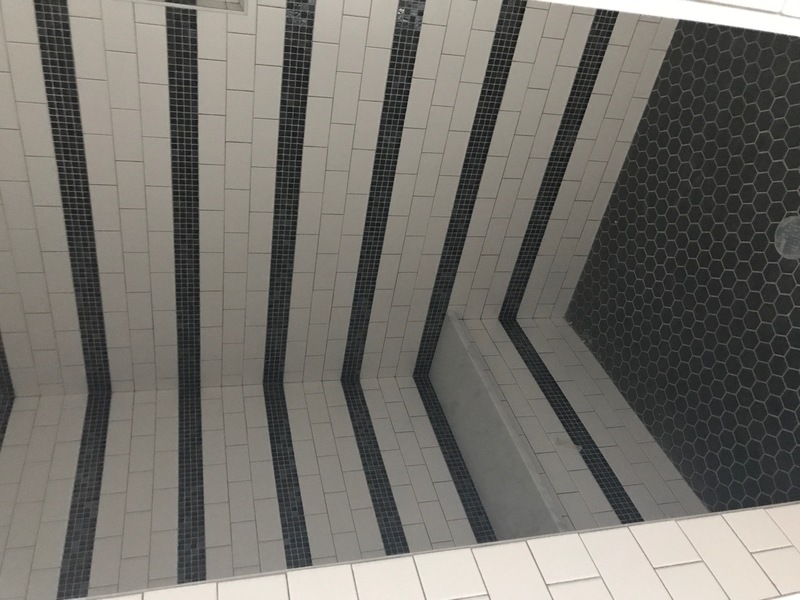 Because the shower wasn’t open to the rest of the room, we decided to go graphic in here as well–stripes!! 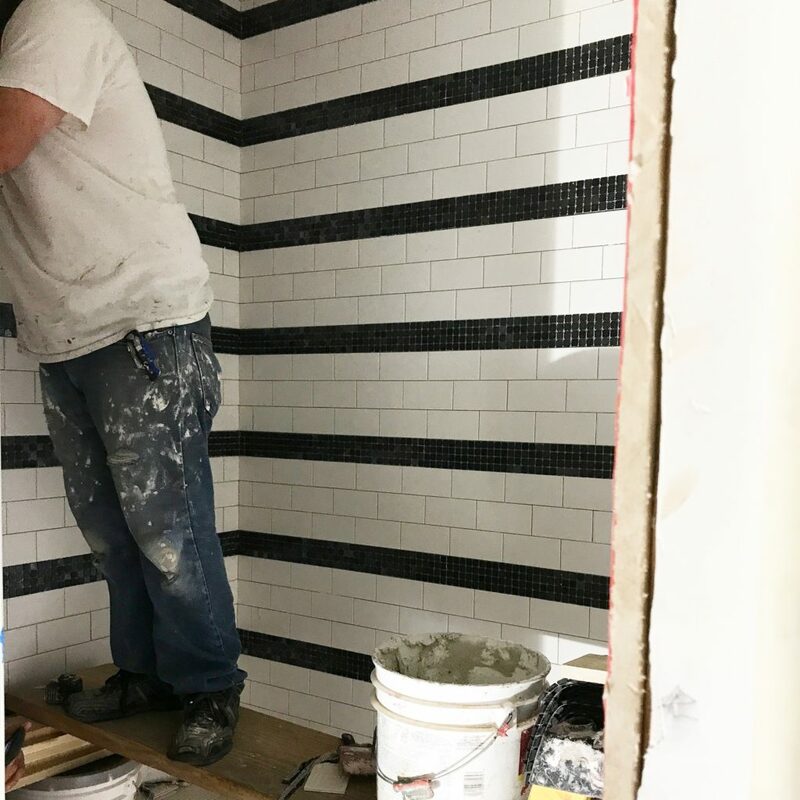 The stripes were created using subway tile from Interceramic with a pricier glass tile mosaic. 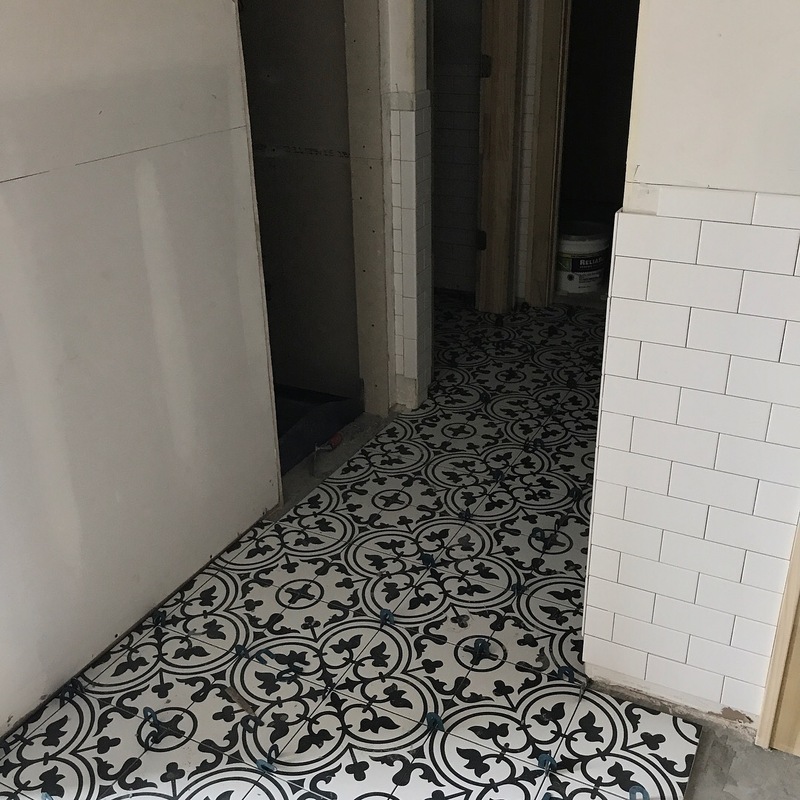 This approach allowed us to use the pricier tile, but in a smaller dose, thus making it more affordable. The impact is crazy good! 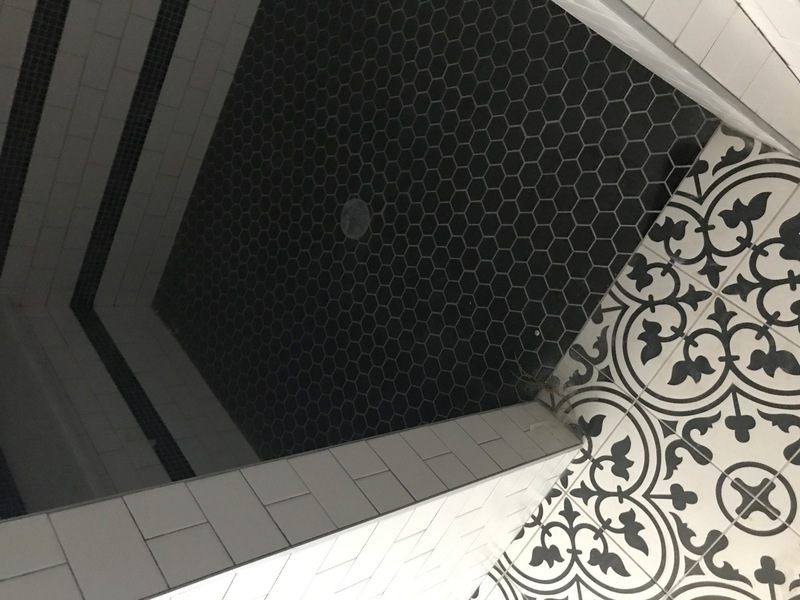 We chose a simple small hex for the shower floor. That is how I always pick paint colors…TOTALLY KIDDING!! PAINT SAMPLES!! More on that here. AHHHHH, here we go! The appropriate way to do samples! I was looking at samples for the whole house at once, that’s why there are a million. 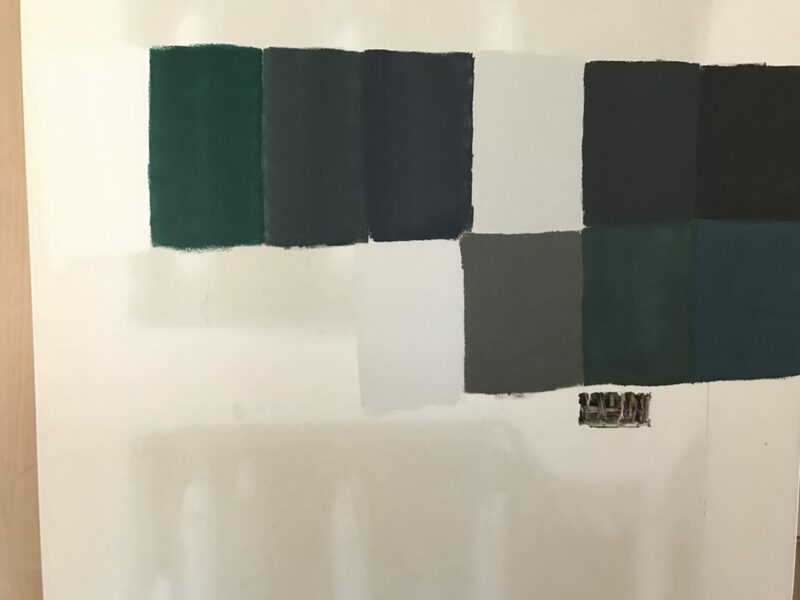 We asked what our instagram followers thought here, and ended up going with Benjamin Moore Black Forest Green. At first glance it is black, but the more you look at it, the deeper the color gets and you can see the green. So stunning, and one we will use again. 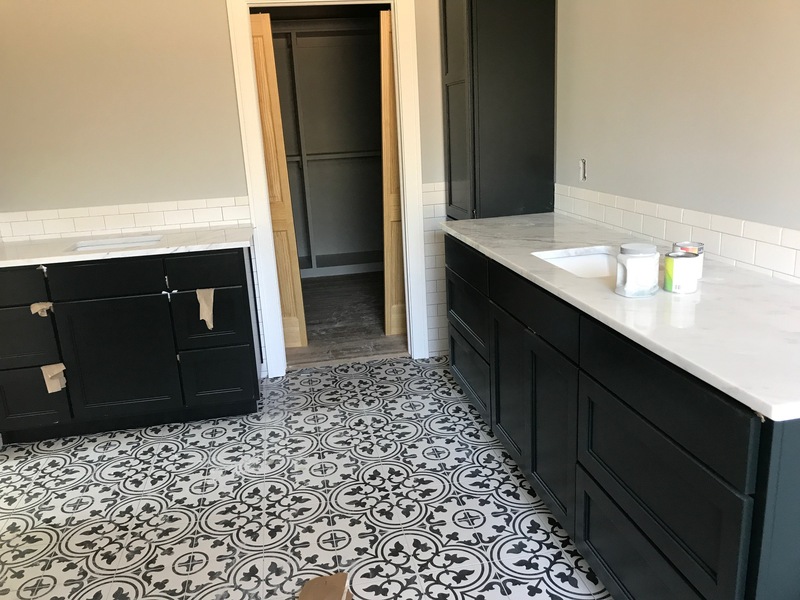 Love this shot of all three tiles together! 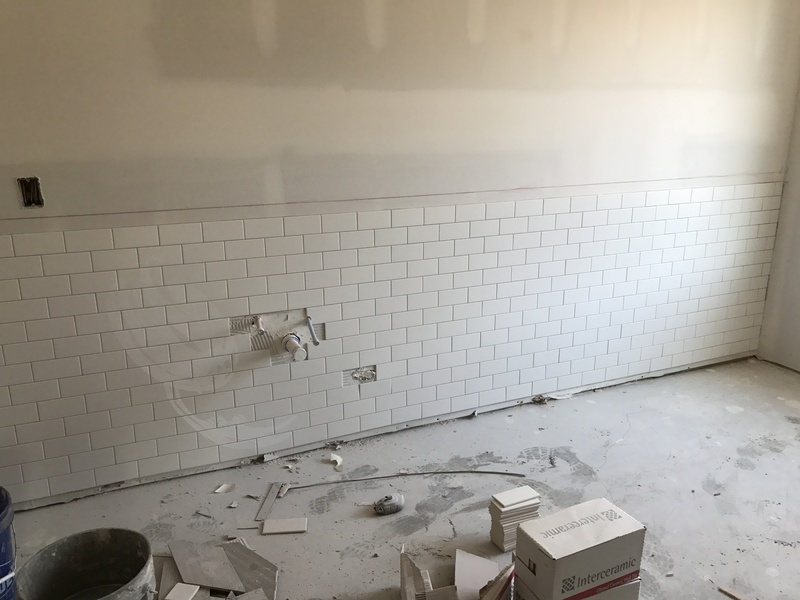 You can see paint, hardware, and finishes starting to come in here! So close to done! Stay tuned for the full reveal! !